My adventure with The science Hour on XpressionFM has sadly come to a close. But boy did we go out on a high. 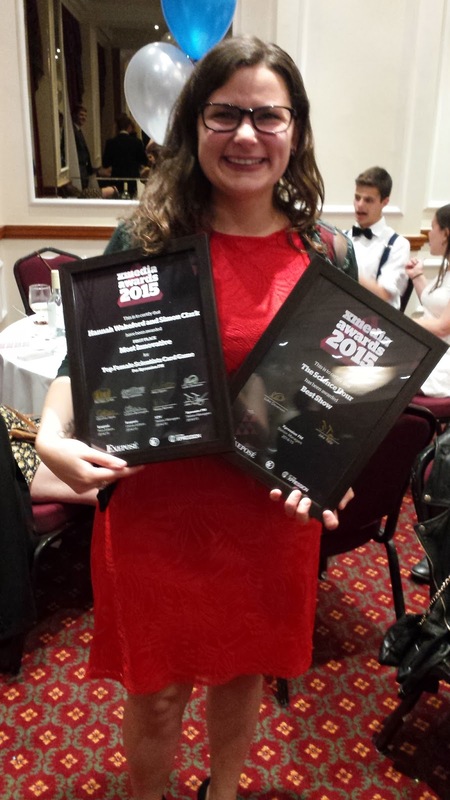 At this years Xmedia Awards The Science Hour won two awards. 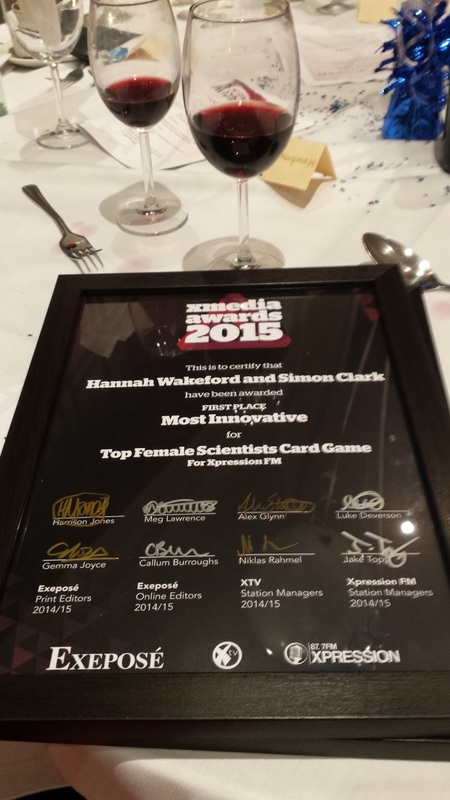 Our 1st from XpressionFM for the stations Best Show, which was a beautiful surprise on the night and I'm so proud of the recognition within a music and sport heavy radio station that a talk show about science captured people and entertained them. Our 2nd came from the Best Innovation category, something myself and Simon entered with our Top Female Scientists card game, which we launched on the show in February this year. You can listen to the Award entry below. The Science Hour has developed into a fantastic entertaining and diverse radio show over the seasons. I think this year we really hit our stride with the format and content to keep a loyal and far reaching audience. Who also appreciated some of the worst music segues in history, I am talking Alan Partridge levels and worse. Over the seasons I have been joined by some amazing and thoroughly intelligent co-hosts and none of the show would have been done without their amazing support and conversation. So, thank you Gareth Jones, Alex Pettitt, and Simon Clark for taking your time and putting yourself out there with me each week. Also to all of the guests throughout the first season who gave us their time to talk about their work. But I thought now was as good a time as any to share how The Science Hour on XpressionFM came to be and how it has positively influenced my PhD journey here at Exeter. Way back in late 2012 while I was on holiday in the US with my sister I received an email from a professor in the Astrophysics group at Exeter where I was in the 2nd year of my PhD urging me to apply for a workshop being run by the BBC Academy for expert women in their fields. At the time I was just finding my stride within academia, attempting to work out if I knew anything at all, let alone calling myself an expert at something. But as with most things that have worked out in my life I went with my philosophy of "what can I loose if I apply for this?" As always the answer was nothing of significance. So, I went for it. I filmed two short pieces to camera about my work and some of the things I thought needed to be highlighted in the media, and sent it in. A few months later I found out that I was selected in the top 60 out of over 2000 applicants and that in March the following year I would be heading to the BBC Academy for 2 days of media training and advanced training with 30 other applicants. But why am I giving you all of this back story, what has this got to do with a student radio show? Well, what this experience taught me was little to do with the technical side of TV and Radio, or even the way that you need to present yourself, I had learnt most of that from watching behind the scenes documentaries growing up and seeing my father giving copious numbers of talks around Surrey where I grew up. No what these few days taught me was, it does not matter who you are or how good you might be at what you do, no one is going to out of the blue ask you to do anything. You have to go out and get it, or do it, or ask for it yourself before anyone will take notice and start asking back. While at the BBC Academy on these two days I did meet a number of other astronomers who were already post-docs in their fields and have kept in touch with them since. One, Emma Bradshaw, was the host of a science show on student radio at Nottingham, which is a well respected student radio station in the student radio circuit. It was later in the summer of 2013 when I met her again at a UK wide astronomy conference that she gave me the best advice. "Just go for it!" By now I was starting my 3rd year of the PhD and well out of the loop of student societies at university and anywhere. Let alone putting myself out there on the radio or TV. Luckily the University of Exeter has a fantastic and diverse media team from TV (XTV Online), Journalism (Exepose), and Radio (XpressionFM). In freashers week I stood out awkwardly at the introduction weeks and group meetings making me want to flee. But I kept chanting to myself "What have you got to lose?" "Just go for it." The leaders of XpressionFM at the time were Hazel Morgan, a wholly wonderful individual excited about the prospect of some BBC Radio 4 style programming, and the ever encouraging Matthew Bate who later became the VP of Activities sabbatical officer for the Guild. It was Matthew who put me in touch with some new people and I was tenacious in getting a full show on the air as soon as possible. The first Science Hour show was broadcast LIVE at 11pm right in the middle of a 30-hour Children in Need broadcast for the station. I was given lees then a days notice to put something dynamic and entertaining together which would involve the two champion hosts for the full broadcast. I managed to rope in the Gareth Jones a new PhD student in Physics who had previously hosted on XpressionFM and was not serving as part of the station committee. The whole launch of the show could never have happened without him, and for that I am very grateful. In January of 2014 we kicked off the term with our regular show and time on Tuesday evenings, and have not stopped since. 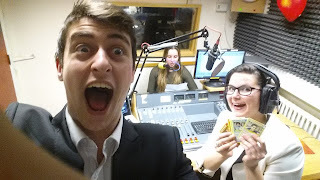 By half way through the term I had been fully trained as a radio presenter and was able to run the show myself. In our first term run we welcomed 12 scientists into the XpressionFM studio, and shared the research from over 5 departments at the University of Exeter. Each episode of the show requires varied levels of preparation, depending on prior knowledge of the subject. 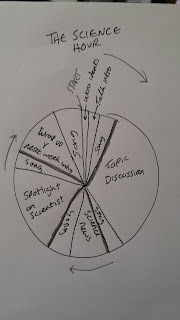 At the beginning of each term I would sit down with my co-host and we would write a list of the different topics that interested us and we wanted to talk about. We would then look at the shows calendar and make a balanced and ordered timetable. 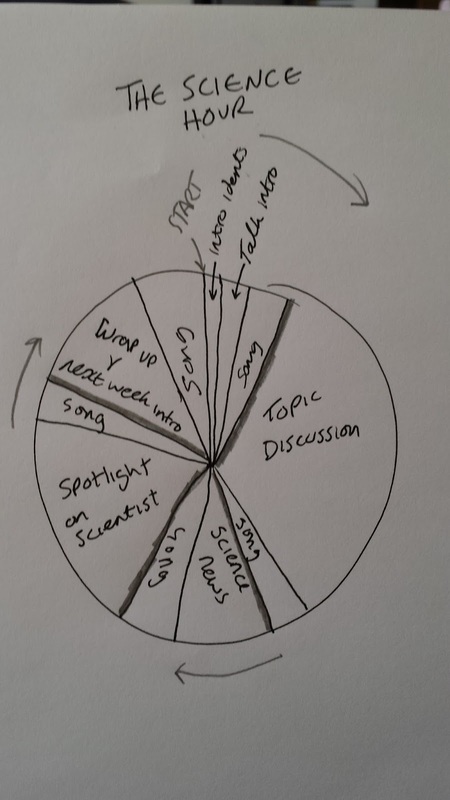 As each show on its own follows the same format a time wheel of the show is simple to fill in, and is a great practice to have if you want to set up your own show of any length. For each episode we find 5 songs with a connection to the topic, though sometimes the most tenuous of links is made between the discussion and the song of choice. We will also try to find the most unsung or unheard of scientist in the field of study to place a spotlight on. The ultimate goal of the show is to provide new and interesting information in an accessible way to our audience. I think the best compliment for the show I have heard is someone coming up to me and telling me a story about a science topic and then finishing the story with, 'oh wait I think I heard that from your show'. Almost all of our listeners within XpressionFM have told us they don't like science, but love the show. That is good enough for me! They don't really hate science, they live in a world based on it (especially on the radio), they just need the best way to hear about it. I hope we were able to provide that. Without the science hour I am certain I would not be as confident in myself or the science I have been working on. It has not only improved my interview skills, but also the way in which I respond when being interviewed. I love communicating my science, and hope that I can continue to do so through all types of media throughout my career. I am also now so much more aware of how little music I know. You can check out our full archive on Mixcloud and please leave any comments below or on our show pages (Mixcloud, Facebook).